Citing this Wikipedia article, Belgium is famous for beer, chocolate, waffles and french fries with mayonnaise. As a team based in Belgium, we certainly couldn’t agree more! 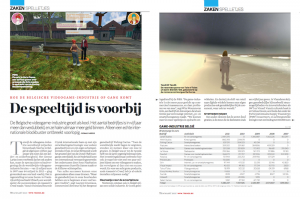 Less well known is the fact that Belgium also has a small but growing games industry. This didn’t go unnoticed by the financial and economical magazine Trends, as they published an article about the state of the industry. Click to view the PDF version of the full article in Dutch. Kudos to Trends for providing the PDF! 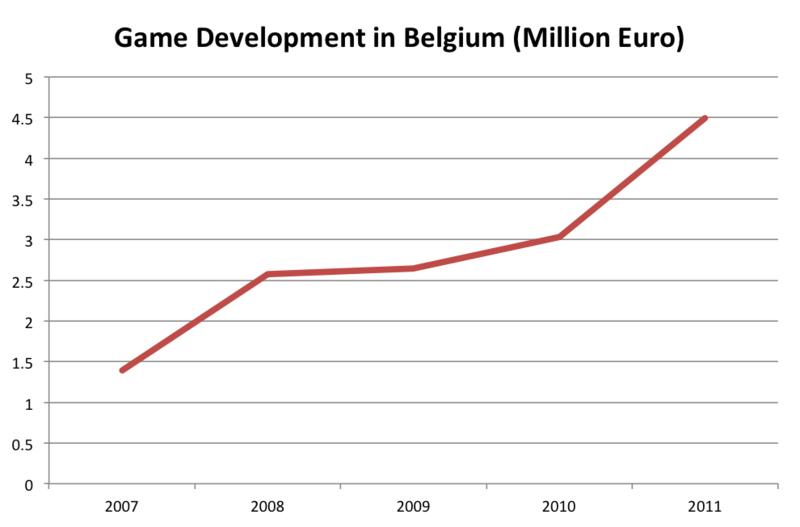 The Belgian game industry has been (and still is) a lot smaller than in most neighboring countries. Mobile games, social games, advergames and serious games: the game industry has been diversifying during the last couple of years. 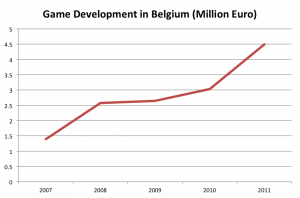 At the same time, the Belgian game industry started to grow. From 7 companies in 2007 to 15 companies in 2011, and a few more since. This means an increase in revenue from about 1.3 million euro to about 4.5 million. Both in Flanders and Wallonia, there is some government support – including subsidies for specific projects and cheap loans. However, some say a tax cut for the entire Belgian game industry would be a more fair measure. Graph based on the article. Not all companies are included in the numbers, but it does give a sense of the growth. Note that I applied a small correction to the numbers, by distributing the revenue of the biggest player over two years, as they extended their financial year.